Nasik is one of the holy cities of Hinduism as it is believed to be one of the places where Rama spent his exile with Sita and Lakshmana. The town lies on both sides of the Godavari river, which is considered to be sacred and has many temples, shrines and bathing ghats. Every twelve years pilgrims come from all over India in occasion of the Kumbha Mela to purify themselves by bathing in the holy waters. Most of the temples at the site date from the 18th century Maratha period; some show the influence of Muslim architecture in the use of dome-like roofs while others have traditional curved spires. The temple in the right in this view is the Rameshvara Temple which dates from the 18th century. It is set in an enclosure and houses a Shiva lingam. 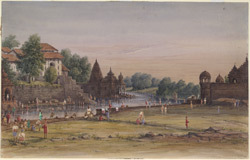 The temple seen on the left is the Narayana Temple, dedicated to Vishnu, built on the steep bank of the river in 1756.